What AskNicely Triggers and Actions are Supported? New Response - Triggers when a customer responds with a score or comment. Add Person - Add a person to AskNicely. Add Survey Participant - Add a new survey participant. 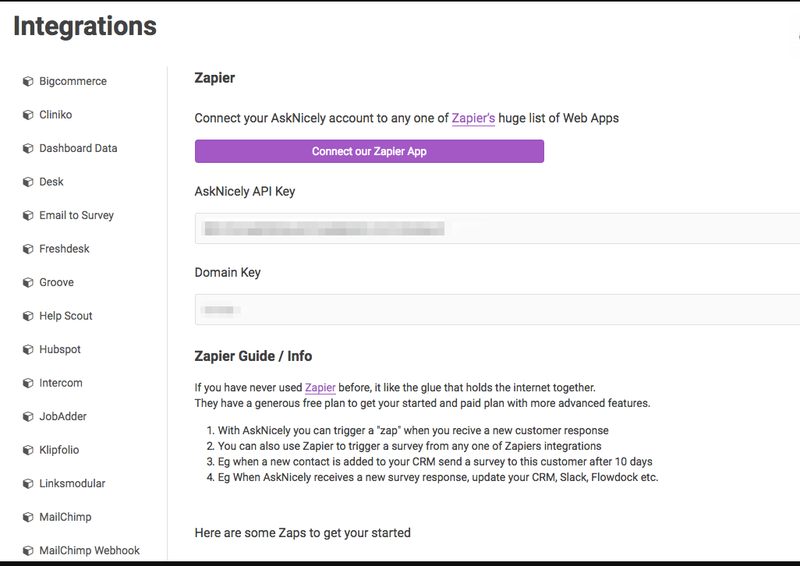 To get started with AskNicely on Zapier, first you will need to click to connect your AskNicely account to use with your Zap. Navigate to this page after logging in. Then select “Zapier” from the sidebar, copy the “AskNicely API Key” and paste it into Zapier’s API key. You will also need to copy and paste the “Domain Key” into Zapier account and then click “Continue”. If your API and Domain Key were entered correctly your AskNicely account will now be successfully connected. If a person already exists, any new details you send will be update this person, eg name, segment. If a person has been surveyed within the period of your contact rules (found on the Send page), we will not survey them. If you want to test Zapier while setting up your rules, make sure your daily scheduler is off and your contact rules are set to 0. If the email address is not valid or blank, the Person will not be added. Delay minutes - will allow you to add a delay to a survey. This way you could send a survey 24 hours later (24*60 = 1,440 minutes). Zapier Extra Info - can be used as an extra field to send custom data through to help identify this person. If you need to send through “structured data” get in touch with AskNicely, and they can help you send “YAML” data. Add Person will add a new person to AskNicely, but it will not survey them. The person must have a valid email address. If this person exists they will be updated. If this person has manually unsubscribed, they won’t be re-activated. If this person was de-activated, they will be re-activated. If this person does not exist in AskNicely their “Created Date” will be the date/time they were added to AskNicely. Generally using the “Add Person” trigger will add people to your pool of contacts within AskNicely that can be surveyed using the daily scheduler. The new response trigger send details about a new response AskNicely has received. There are a few points to note about when a new response gets triggered. Remember, that our survey is two steps, a customer can leave a score, then they are also asked for an optional comment. A new response will be triggered immediately if a customer leaves a comment. A new response will be triggered approximately 5 minutes after a customer leaves a score but has not opted to leave a comment. If a customer saves a comment after 5 minutes, the trigger will fire a second time. The count variable within the data will be increased by 1. In this case, count will be now 2. All responses have an ID variable that you can use to keep updates in sync.